New Amex Offers are available. I glanced all of them, and one is a really good offer. Now, there is the same offer to my Serve card. What is going to happen this time when I use Serve for the purchase? Probably, the order will be declined, and luckily get $10 good faith credit later or they don’t give me good faith credit this time. Whatever it happens, I don’t lose money. 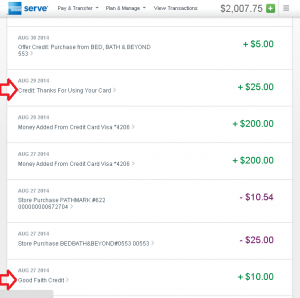 So, I checked out $200 gift card with Serve via Topcashback (1.5%) portal. As I expected, I received an email of “You just used your Amex Offer” right away. And, 15 minutes later I knew that my order was approved. I was surprised. Last year, they said in the email, “At this time we do not accept gift cards as a form of payment.” So, do they accept GCs as a form of payment now? Can I use Amex GCs to buy Amex GCs? If they accepted Amex GCs for Amex GCs purchases, and cash back from portals pays $2000 GC purchase, it would be great. For example, you order $2000 Amex GC via 1.5% cash back portal (say you have enrolled in premium shipping plan) and you use that GC for smaller denominations of Amex GCs purchases. Now you have 4 Amex GCs, $1988.15 in total (2*$500, $496.05, and $492.10.) and earn $60 cash back! However, the rule of cash back has changed recently. They pay cash back for the purchase of $200 or less. A purchase fee of $200 GC is roughly 2%. 1.5% cash back isn’t good enough to earn extra cash back. Please note that I’m not sure that Amex accept Amex GCs for Amex GC purchase. And my order ($200 GC purchase with Serve) can be declined in the future. 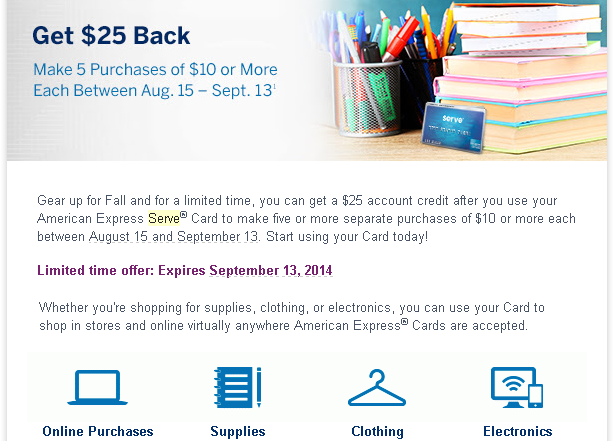 $200 Amex gift card (the order placed on 10/3) has arrived on 10/6, and $10 statement credit has been posted on 10/9. So, they now accept Serve as a payment for the purchase of gift cards. What about other cards? Probably, they accept Bluebird as well, but what about Amex Gift cards. 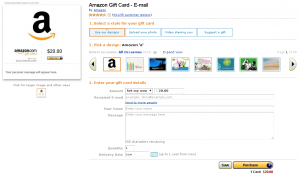 Can I buy a gift card with a gift card over and over? On the order placed on 10/3, I didn’t use a promo code to waive a purchase fee. That was stupid of me because cash back earned from Topcashback is only $3. It won’t even cover a purchase fee. I shouldn’t have expected cash back and just used a promo code. So, on my next order (paid with one of my Amex credit cards), I used a promo code. However, just in case I clicked Topcashback’s link. Then, I received email from them and saw $3 pending cash back posted in my account. I hope this won’t be clawed back. I received Amex Serve card yesterday. This is my second card. It has a new design (see picture below.) I closed Serve account at the end of last year and opened Redbird. Redbird had been a great tool for MS until May 6th. But now, I can’t use it for MS at any Target stores in my neighborhood. So, I closed early this month and re-opened Serve. I activated the card and linked my bank account and debit card. For a bank account, I need to wait for probably a few days to see a small deposit that Serve will make to my bank account. And then I will need to verify it. For a debit card, I linked PayPal Business Debit card. The debit card is linked to my PayPal account in which its balance is always zero. I set PayPal Extras MasterCard credit card as a backup funding source. When I use the debit card, an amount is automatically charged to PP Extras credit card. However, it didn’t work with Redbird, I think that’s because a type of transaction is not a regular purchase, rather like a cash advance. So, PayPal declined transactions, I guess. If you have enough money in your PayPal account, it goes through. I thought I would be the same result for Serve, but I just wanted to try adding $200 with PP debit card that is linked zero-balance PayPal account. As I thought, the website showed the same error message as Redbird. And soon after, I received an email that told me to upload copies of my ID and the debit for a security reason. When I have money in your PayPal account, there was no problem to online-load both Serve and Redbird. Although the transaction is only a transfer of your money from PayPal account to Serve account, you can earn 1% cash back from PP debit card. Serve sent an email that I need to upload photocopy of ID and debit card. During the investigation, some features can’t be used. Whenever you change linked cards, they always request photocopies. Usually, the investigation will be done next day. I see some changes on the website from last year. Amex Offers are visible on the website. You can see a list, details of offers and add them without leaving for Twitter or Facebook. However, you’d better check all of them because numbers of offers are different in websites. Currently, I see 35 offers at Serve.com, but there are 49 offers at Facebook. So, check all of them not to miss good offers. 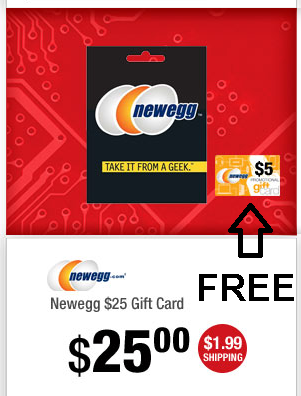 Newegg offers free promotional gift card when you purchase physical Newegg GCs. Get $5 promotional GC with purchase of $25 (limit 2), $50 (limit 1), and $100 (limit 1) Newegg GCs. Newegg charges $1.99 for shipping. When I added two $25 GCs to the cart, the shipping cost was $2.99. And then I added $50 and $100 GCs. The shipping cost was still $2.99. So, the total is $202.99, and you will get the total $20 promotional GCs. Promotional GCs will be emailed four days after invoice. If you haven’t redeemed Amex Offer “Get $25 statement credit for $200 or more purchases by 12/31/2014,” it’s a good time to use your American Express card. Once you buy GCs (redeem Amex offer), you don’t have to worry about a deadline or minimum purchase. Newegg is an online retailer of computer hardware and software. But, they also sell games, cell phones, watches, apparel, tools, etc. You can redeem Newegg GCs for their merchandises. In case you don’t find any items of your interest, there always is an option to buy third party e-GCs with Newegg GCs. Click here to see the list of retailers of 3rd party GCs at Newegg.com. You may also pick any free-after-rebate items. You can find something that is free-after-rebate anytime. Mostly, you receive Visa GCs as a form of a rebate. There are many options to liquidate Newegg GCs. So, whenever this type of offer is available, you should redeem it. There is a new Amex Offer for Newegg. “Earn $25 statement credit on $200 or more purchase at Newegg.com, Limit 1 per card.” I frequently shop at Newegg, but buy only free-after-rebate items. Usually, they don’t add up more than $200 because free-after-rebates are very timely and don’t exist many of them at the same time. So, I decided to buy Newegg Gift Card. I entered the website and click “Gift Cards” tab. Then I got to know that Newegg sells third-party gift cards. While browsing gift cards, I happened to see this deal. “Free $5 Newegg promotional GC on $25 physical GC purchase, limit 1.” The deal is for a physical GC purchase only and costs you $1.99 for shipping. I added $25 Newegg GC and $25/$50/$100 Kmart GC (email delivery) to the cart and checked out. The total is $201.99, which is eligible for Amex Offer. Online shopping portal sites don’t offer great cashback on Newegg purchases. But it’s good to know that Newegg sells third-party GCs, and it’s useful when Amex Offer and other similar deals are available. Updated: Newegg charged this transaction separately ($26.99 for Newegg GC and $175 for Kmart GC.) It’s been hours since I placed an order, but I haven’t received Kmart e-GC. So, I canceled them. Then I made an order of $200 Newegg e-GC. You can choose from $10 to $2500. I purchased one $200 e-GC so there is no way to separate the transaction this time. 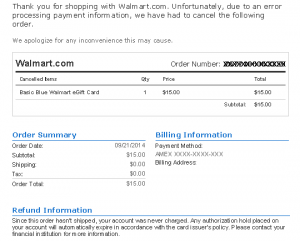 What happens when retailer cancels your order with Amex Offer? For sure, I entered credit card number correctly because I received an email from American Express. However, there is a pending transaction in the history of my credit card. So, I just waited until this pending transaction would disappear. Although I received “Thank You for using your Synced Card!” email from AmEx, the offer of Walmart had been in MY OFFERS (a list of offers that is synced, but not yet redeemed), not in MY SAVINGS (a list of offers you redeemed). 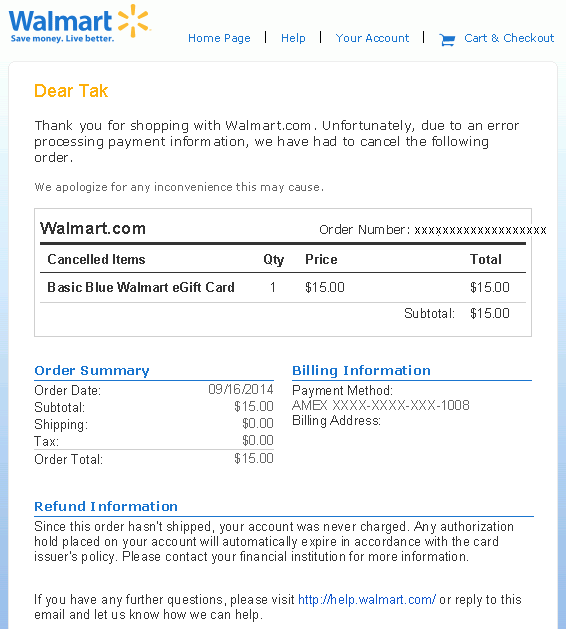 When a pending transaction disappeared from the history, the offer of Walmart stayed in MY OFFERS. I placed another order of E-gift card, but the order was also canceled. I waited another a few more days and then placed an order of physical gift card. This time, it went through. I didn’t receive an email from AmEx, but $5 statement credit was posted a few days later. If the order is canceled after a statement credit is posted, it is probably a different story. As long as the transaction is still pending when retailers or you cancel an order, you won’t lose Amex Offer. There is new Amex Offer. “Get $5 statement credit when you spend $15 or more at Walmart.com.”It is only for online purchases and not valid on gift cards reloads and prepaid cards. I understand what exactly “gift cards reloads” means, but I’m not sure about “prepaid cards.” Since the terms doesn’t say “not valid on gift cards” but “not valid on prepaid cards,” I assumed that the purchase of regular gift cards is eligible for the offer. 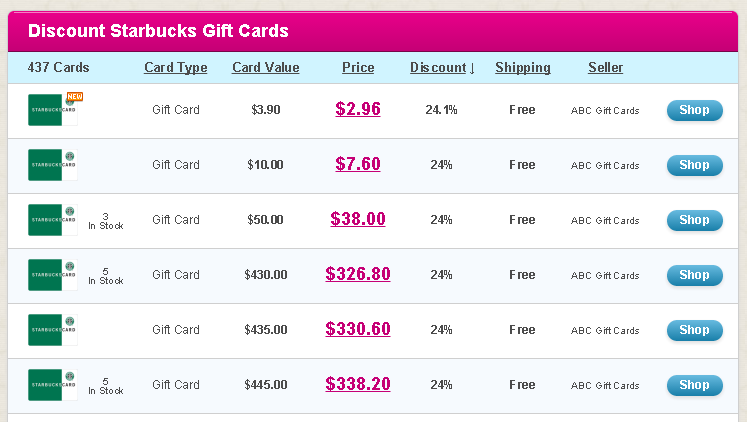 I browsed gift cards at Walmart.com, and I find that only Starbucks gift cards are useful to me. However, there is no denomination of $15. They have $25 and $30 (3/$10 multi-pack). If I buy $25 Starbucks gift card and get $5 statement credit, it’s like a 20% discounted gift card. It is a lot of discount, but you can find better deals at gift card exchange sites. 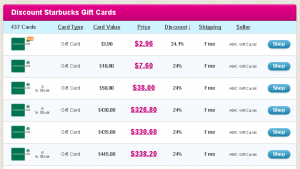 As you see in the picture, ABC gift cards are selling them with 24% discount. After adding some gift cards to a cart and pretending to check them out at Walmart.com, I found that Walmart probably allowed to use GCs for purchase of other gift cards except for Visa, MasterCard, and American Express GCs. It seems that they even allow to purchase Walmart GCs with Walmart GCs. And you can choose any amount of Walmart GCs between $10 and $1000 in one cent increment. (e-gift cards are between $5 and $200.) So, when you buy $15 Walmart GC with Amex Offer, you get 33.33% off deal. I have two AmEx cards that can sync with Amex Offers, Blue Cash Preferred and Serve. Buying $15 Walmart GCs with each card and then redeeming them for $30 Starbucks GC will be perfect to get the full of the benefit of this offer. 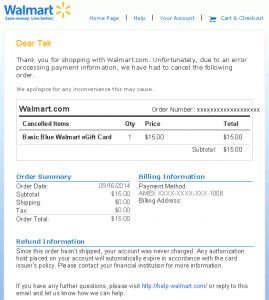 I chose e-gift card to save time and checked out one $15 Walmart GC with Blue Cash Preferred. Almost at the same time as check-out, I received an order confirmation email from Walmart and “Thank You for using your Enrolled Card” email from AmEx. 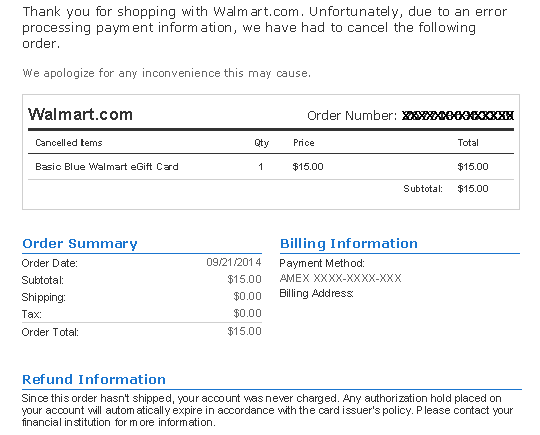 Then when I tried to buy another $15 Walmart GC, a problem happened. Walmart sent another email that told me the order was cancelled because my payment couldn’t be verified. I don’t know what caused the error, but I’m sure I enter the right credit card information because I received confirmation emails from both Walmart and AmEx. My question is what happened to my Amex Offer now. It can be redeemed only once on each card. I have never experienced this type of thing before. I’d better wait till the pending transaction will be cleared. I received two credits from Serve recently. One is $25, and the other is $10. As for $25, a short description says, “Thanks for Using Your Card.” And here is an email I received earlier. I needed to make 5 transactions of $10 or more to receive the credit. I started using my Serve card on Aug 27th. I believed that was the transaction#1. And I would need 4 more transactions, and I was thinking where to use. But two days later, somehow I already received the $25-credit. I check my transactions since Aug 16th. I made six bill pays and 2 regular purchases. One of them is the purchase of gift cards at Bed Bath and Beyond. The purchase was for Amex Offer “$5 back on $25 or more purchase.” I wasn’t sure if this transaction was eligible for another offer. So I didn’t count as one of five transactions for the new offer. However, the credit was posted, that means I didn’t have to do anything for the new offer. It seems that only regular bill pays meet the requirements to receive the credit. The other credit is $10 and was posted on Aug 27th. It is described as Good Faith Credit. I had no idea what this credit is for until I received this email today. At American Express, we are committed to providing you with the best American Express Serve® Account experience possible. We recently fell short on this commitment and experienced an error related to an offer you added to your Serve card. We’d like to take this opportunity to tell you more about this error and how we’ve resolved it. We offered you a one-time $10 statement credit when you used your enrolled Card to spend a total of $200 or more on American Express Gift Cards. Although you were able to enroll in this offer, your American Express Gift Card order was declined, and you were not able to receive the $10 credit. To correct this error, we have issued a $10 statement credit to your American Express Serve Account. We would like to offer our sincere apology that you were unable to redeem the offer. If you have any questions, please call us at 1‑800‑954‑0559 to speak to an American Express Serve Customer Care Professional. We truly value your membership and will continue working to ensure you have a positive American Express Serve Account experience. I remember this. There was Amex Offer, but you couldn’t redeem. I actually synced the offer and tried to make a purchase of AmEx GC. The transaction was declined because they don’t take prepaid or gift cards as payment. (see details here) No big deal, I didn’t care much about it, but American Express took it seriously and resolved generously. American Express issues lots of useful offers and takes good care of their customers. American Express Serve is Reloadable Prepaid card that has exclusive features. By using full of these features, you can save money when shopping and use it for manufactured spending. First off, these are some unique features for loading Serve. You can load Serve with your credit card. It can only be done online. First, you have to choose a credit card and link to your Serve account. You can link only one credit card. You can change credit cards, but you need to remove the current card and then link another card. The limit is $200 a day, $1000 a month. The rule is the same as credit card’s. Only one debit card can link to Serve account and limit $200 a day, $1000 a month. If you have a point earning debit card, use it. As for me, I have PayPal Business Debit MasterCard that offer unlimited 1% cash back on purchases. Every month, I earn $10 cash back by loading $1000 to Serve with PayPal debit card. Visa/MasterCard gift cards have a feature of debit card. You can load Serve with debit cards at Walmart ATM. 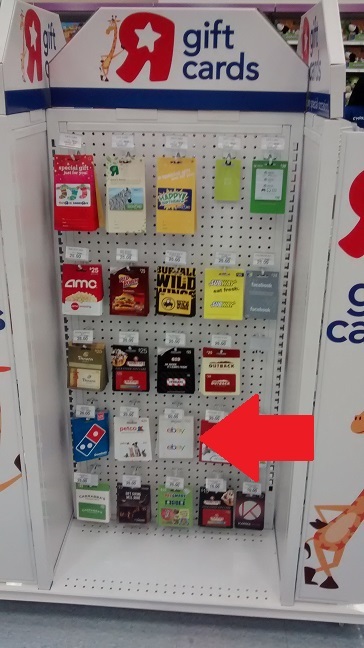 As long as gift cards have PIN, you can use them at Walmart ATM for loading Serve. Limit is $1000 a day. I’m not sure about monthly limit, but combined with all types of loads should be less than $10,000. You can consolidate all Visa/MasterCard gift cards you purchase at the time of promotions, to meet requirement of sign-up bonus, etc. I can use my PayPal debit card for loading at Walmart, but PayPal doesn’t offer cash back for PIN purchase (transaction as a debit card). So, there is no meaning to use regular debit cards for loading at Walmart ATM. These are not all the ways to load Serve, but the useful ways for manufactured spending. Once you load Serve, you have many ways to unload it. With your bank account linked to Serve, you can transfer money between them. It is not only adding money to Serve, but also withdraw money from Serve to your bank account. You can pay bills of your credit cards linked to Serve account, used for purchase of Visa/MasterCard GCs, etc. Please note that you should avoid unloading right after you load Serve. 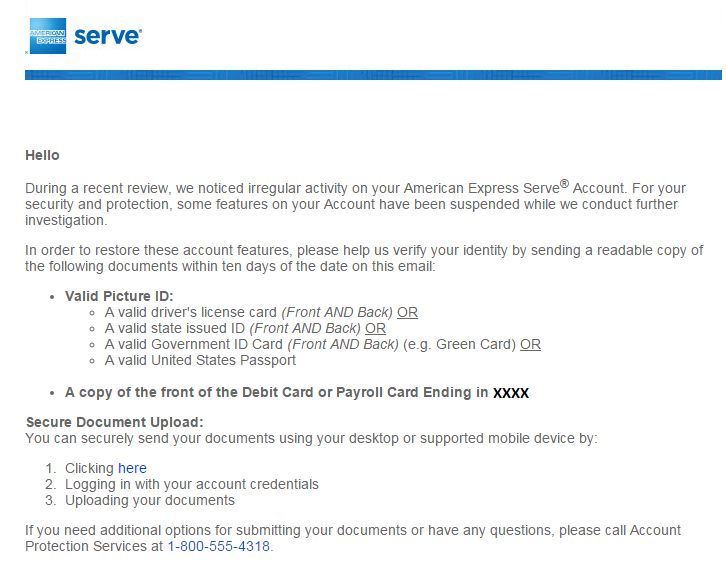 American Express may close your account if the transactions obviously show that you use Serve for manufactured spending. For example, load $1000 with a credit card and then pay exact $1000 credit card’s bill. Leave the money in Serve account for a while then unload it. More favorably, you should use some money in the account for regular purchases. Unlike reward credit cards, you can’t earn cash back or travel points through regular purchases, but Serve can sync with Amex Offer. There are always many offers, and new offers frequently keep adding. If you are not interested in any items in the store, but they sell other store’s gift card, buy a gift card to get statement credit. There is no fee when you do anything described above. They charge $1 as monthly maintenance fee, but you can waive the fee by loading $500 or more. So, I believe that no one is ever worried about it. American Express Serve is a must for manufactured spending. Online load with credit and debit cards are very convenient. Plus, loading with Visa/MasterCard GCs at Walmart ATM makes it possible to create more manufactured spending. 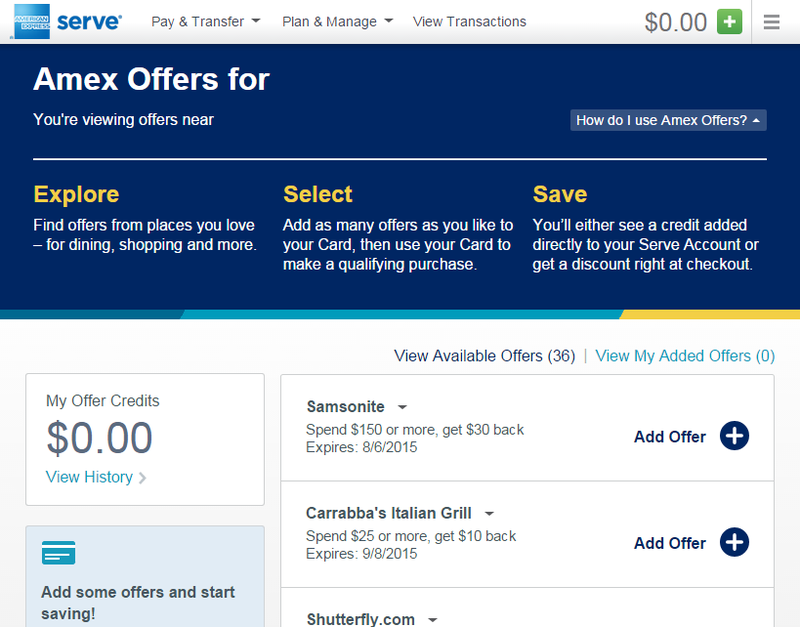 Amex Offer helps you unload Serve and makes it less obvious what you are doing (using for manufactured spending) and gives you savings at the same time. The features on this post are key features that I think it is useful and important. Of course, there are more features that is general or may be useful to you. Please visit www.serve.com for full information.